Department of Metallurgy & Materials Science, College of Engineering Pune. 12th, September, 2015 Recent Trends and Advances in Forging Industry Mini Auditorium, Academic Complex, College of Engineering Pune. 1st September, 2015,5.00 PM Technological Challenges to Aluminum Scrap Recycling by Professor T.R. Ramachandran Mini Auditorium, Academic Complex, College of Engineering Pune. 15 Sepetember 2014 Product Development :Material & Design Perspective Sandip Institute of Engineering & Management Seminar Hall, Sandip foundation, Mahiravani,Trimbak,Nashik. the General Body Meeting to be held on 17th August, 2013. Registration Form Institute Auditorium College of Engineering, Pune Shivajinagar. 22 June,2012 (Friday) Todd A. Bonesteel-guest lecture College of Engineering Shivajinagar. 3rd April, Tuesday 2012, at 4.30 pm Solar Cell Technology and Business with emphasis on Crystalline Silicon Solar Cells COEP, Pune. CSET 2012 Registration Form COEP, Pune. National Metallurgist Day Celebration Schedule COEP, Pune. 10 Feb 2012 ASM_IIM Student Interaction Meet COEP, Pune. 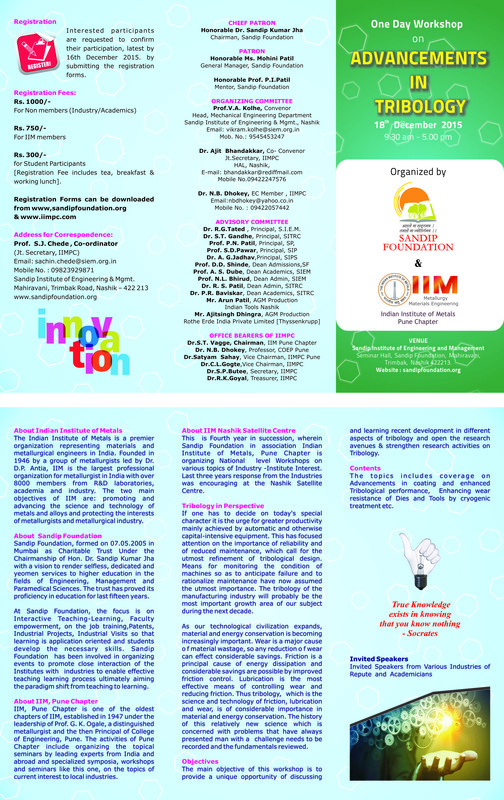 7 January 2012 One day workshop on Heatreatment, Failures and Surface Engineering Nashik. Speaker : Kumar Sadayappan, PhD CANMET Materials, Canada COEP, Pune. Speaker : Dr.V.C.Srivastava COEP, Pune. Speaker : James Ritchey, Director, Bio Materials & Medical Devices, Instron, USA COEP, Pune. 06.30 pm World Class Foundry A Few Criteria & Customer Expectations. Speaker: James Eugene Demarest Poona Club, Pune. JRD Tata Award for "Excellence in Corporate leadership in Metallurgical Industries".